Perhaps it’s one of those days where you just want to curl up on the couch all day and watch bad Lifetime movies, or maybe it’s your birthday and everyone forgot so there was no cake. Okay, sorry, that last one was kind of depressing. Anyway, It’s necessary to wake up the day! Just a bite of something to make a strong impression and awaken our senses. Just a Bite! What could be more successful than the smell of cinnamon or vanilla and apples ? Apple Crisp ? 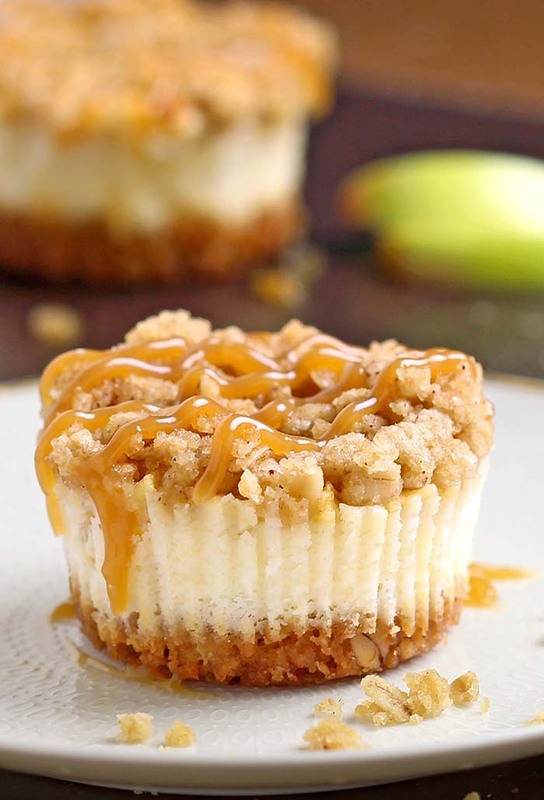 At this particular moment I cannot think of anything more delightful than a graham cracker crust cheesecake filled with apple crisp yumminess. Anyway, my point is, sometimes you just need a bite of cake to make things right. Just a bite. Mini portions are ideal for a few reasons: most guests won’t want to eat an entire slice of cheesecake, miniature desserts typically appear more elegant, and perhaps most importantly – portion control. So even if the calories presented in each choice are the same, we perceive the amount to be greater if the food is portioned into smaller pieces, and thus are more satiated with small pieces rather than one big piece. Still here ? Not yet baking mini cheesecakes ? There are a lot of fruit variations. (so easy to customize to your tastes or to make a variety of flavours for guests!). In a mixing bowl combine graham cracker crumbs, rolled oats, melted butter and brown sugar together. Line 16-18 muffin cups with liners. Bake for 5 minutes. Remove from oven to cool. Meanwhile in the bowl of your electric mixer blend together cream cheese, brown sugar, white sugar, cinnamon, ginger, cornstarch and vanilla. Once well combined, pour on top of your mini graham cracker/oat crusts, leaving room at the top for fruit and streusel. Combine all streusel ingredients and mix together until crumbly. To start your apple layer, arrange the finely chopped apple on top of the cheesecake in a single layer. Top with the Apple Crisp Topping. Bake at 350F for 25-30 minutes. Once it's done cooking, cool for 15 minutes, then refrigerate overnight. Top with caramel sauce and serve. This entry was posted in Cakes, Muffins & Cupcakes and tagged Apple, cream cheese, graham crackers, oats on August 2, 2016 by Dan. Ive never seen something more charming in my life! I love the idea of mini cheesecakes because its personable and allows portion control. Great idea! Are you sure no egg is added to the cheesecake batter? Yum! These look so good! I love the idea of them being portable! Perfect for a fall festival or tailgating! What kind of apples do you like to use? I made these for dessert for after my Halloween dinner. They couldn’t have been better. I highly recommend this recipe! My batch made 17! And I think I’m gunna make more! What if I don’t have coconut oil? Can I make these without coconut oil?